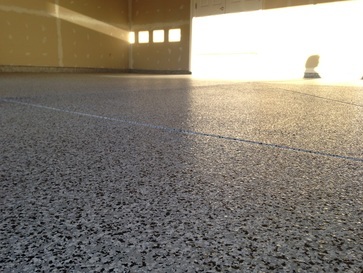 Rochester Epoxy Flooring can give your garage concrete a glamorous appearance. Epoxy floor coatings aren’t new to the flooring industry, and we have been applying epoxy floor coatings for eight years. The best part is that they are very affordable. When you call us, we give you a no hassle consultation and accurate estimates. Epoxy coatings have been used for years on industrial floors because of its toughness, durability, and resistance to oil, grease, and most other chemicals that ruin regular old paint. That’s why many mechanic’s shops and dealerships use them. However, in recent years, it has become a growing trend for homeowners to use epoxy floor coatings, and we make having epoxy garage floors in your residential home within your means. Having an epoxy concrete floor is a great idea for many rooms in your living space, including your laundry room, garage, and basement. It covers dreary concrete flooring and provides you with stylish and simple-to-maintain surfaces. It stops stains from spills or leaky vehicles, all the while keeping a solid concrete exterior. It lessen the necessity for future repairs triggered by salts and chemicals that damage the concrete. The biggest advantage of having epoxy garage floors is that it’s become relatively inexpensive for residential homeowners. In most cases, it can be done without spending a whole lot of money, depending on the size of the floor and the type of epoxy used. Epoxies come in a variety of colors and styles to match any home decor. We are more than happy to help you pick out the best possible colors. When shopping for epoxy floor coatings for your garage floors, let us make sure the job gets done right. If you are unsure of what type of epoxy coating will work best for your garage floors, all you have to do is reach out to us. You don’t have to worry much about finding the right product. Our epoxy flooring professionals takes care of that for you. We have the skills and know-how. All you have to do is let us assist you. Let us take the worry factor totally out of it! We also apply a clear coat of concrete sealer on top that acts as a sacrificial coat and keep your new epoxy flooring for your garage looking marvelous. Our long lasting, beautiful shine is how we got our reputation. Try Rochester Epoxy Flooring and our epoxy flooring experts will complete your project on time and in a professional manner.